The brands unveil a host of new gear on Indiegogo, with proceeds funding indoor climbing opportunities for disadvantaged youth. You might not peg TOMS Shoes as a climbing brand. But the California company is hoping its charitable-giving ethos will help attract climbers to its latest footwear release: a climbing shoe. Specifically, TOMS — purveyor of lifestyle shoes — has partnered with climbing brand So ILL and youth nonprofit 1Climb to help launch gear with a purpose. 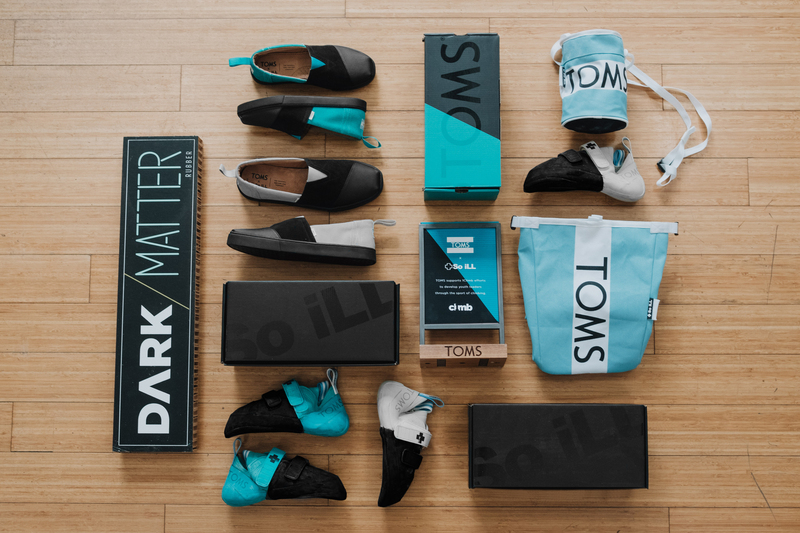 Live now on Indiegogo, the TOMS and So iLL lineup includes a technical climbing shoe, casual outdoors shoe, and chalk bag. Proceeds from the campaign will help fund construction of indoor climbing walls inside Boys & Girls Clubs across the United States. 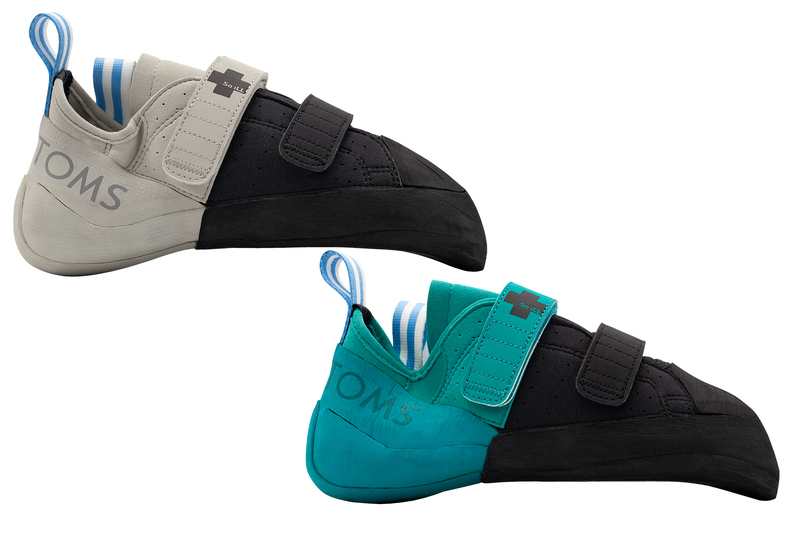 The climbing and casual outdoor shoes build off of So iLL and TOMS’ designs, respectively. In total, TOMS and So iLL are launching five products exclusively for 1Climb’s campaign. Perhaps most striking are the climbing shoes, which sport So iLL’s “Dark Matter” rubber with the TOMS name along the heel. The two styles, available in women’s and men’s, are based off So iLL’s Street and Street LV offerings. Both shoes sport vegan construction and materials and cater to intermediate-to-advanced sport climbers. The LV (low-volume) model has a tighter fit for narrower feet. 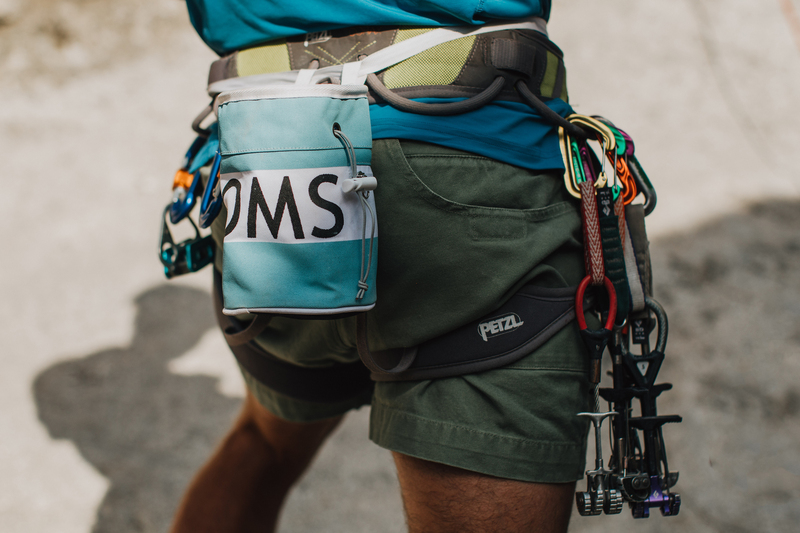 TOMS also launches its own branded chalk bag for the 1CLimb campaign. The chalk bag has a drawstring closure and a small zipper pocket, and the larger chalk bucket has a Velcro closure and zip pocket. 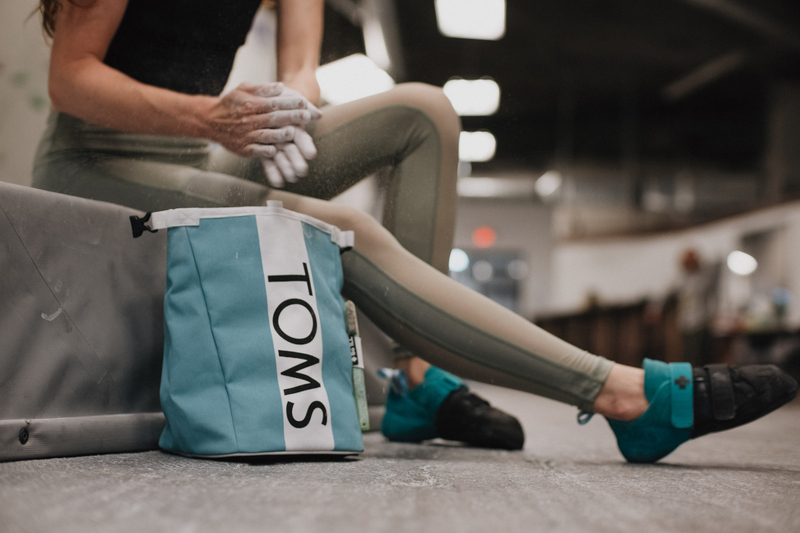 Both the bag and roll-down bucket sport the TOMS logo. Finally, TOMS classic Alpargata Cupsole slipper-shoe receives So iLL’s Dark Matter rubber and is available in the campaign. Each of the TOMS x So iLL products is exclusively available as a perk for 1Climb’s Indiegogo campaign. Backers can choose to nab the perk, with 50 percent of climbing gear and 25 percent of lifestyle gear going to fund youth climbing walls. Or, backers can forego the gear and request 100 percent of the donation go toward 1Climb’s mission. 1Climb co-founder and professional climber Kevin Jorgeson helped launch the nonprofit after installing its first climbing wall inside a Boys & Girls Club in Sonoma, Calif. Since then, the organization has installed a second BGC climbing wall in St. Louis, Mo. and, by its count, introduced more than 5,500 kids to climbing. “Why not bring climbing to the next generation instead of waiting for them to find it?” Jorgeson said. TOMS and So iLL’s partnership will help bolster the private funding 1Climb has relied on to complete its projects, including a new climbing wall in Los Angeles slated to open this fall. According to 1Climb, the Los Angeles wall will be a big step toward reaching the organization’s goal of introducing 100,000 kids to climbing. To pitch in or get some of the exclusive gear from TOMS and So iLL, head over to 1Climb’s Indiegogo campaign.